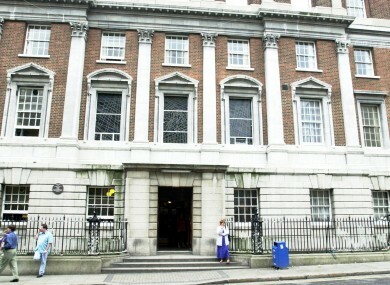 The National Maternity Hospital, Holles Street. OBSTETRICIAN DR PETER BOYLAN, Clinical Director at the National Maternity Hospital, has expressed his anger that patient details have ended up ‘splashed on newspapers’ this morning. The Irish Times reported today that doctors at the Holles Street hospital carried out the country’s first termination under the provisions of the Protection of Life During Pregnancy Act 2013. Dr Boylan disputed whether the procedure cited could be labelled the first in the country. “We don’t have access to all obstetric units in the country and I doubt if [the journalist] does too,” he told Morning Ireland, before refusing to answer whether it was, in fact, the first termination to be carried out at the hospital under the new laws. “We would be caring for patients and making appropriate decisions such as this regularly,” he said. Dr Boylan also told the broadcaster that he will begin investigating the source of the leak immediately. Patient confidentiality is at the root of this whole thing. It is absolutely unacceptable for patient details to be splashed around the front page of the newspaper. “Patient confidentiality is absolutely critical in our dealing with women in sensitive and difficult situations,” he continued. “This is not the sort of behaviour you expect from a serious professional. It is completely unprofessional to give details of a patient which allows her to be identified. Can you imagine her distress to find that her details are spread across the front of newspaper and being discussed in the news? It is outrageous. Boylan also said that the “most serious thing about this whole episode is the serious breach of patient confidentiality”. According to the newspaper, the decision to carry out the procedure was taken as the patient was at risk of sepsis. Her 18-week twin pregnancy was unviable and her membranes had ruptured. Journalist Paul Cullen reports that the case has many similarities to that of Savita Halappanavar who died in University Hospital Galway last October. Senior obstetricians at Holles Street, including master Dr Rhona Mahony, were involved in the decision and, according to the report, the procedure was performed under section 7 of the act which deals with the risk of loss of life of a woman from a physical condition. Before the legislation was introduced, the same course of treatment could have been provided but the new laws ensure against any Medical Council case. Choice Ireland has said it hopes the woman involved is now healthy and well. A spokesperson told TheJournal.ie that it is worth remembering that it is not the first Irish abortion and that 12 Irish women will travel abroad today to terminate pregnancies. Email “Doctor angered at ‘outrageous breach of patient confidentiality’ at Holles Street”. Feedback on “Doctor angered at ‘outrageous breach of patient confidentiality’ at Holles Street”.